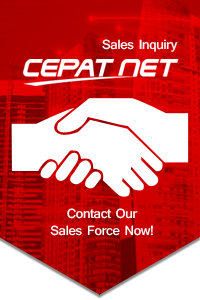 CepatNet was established in early 2000. As the name of 'Cepat', our business expands in a quantum leap driven by young and dynamic professional employees. We steadily become one of the prominent players in providing telecommunication solution to the market. Recently, our business portfolio has been expanding, not only serving corporate segments but also covering residential consumers. The variety of services is constantly improved every time to give more room for customers to choose services according to their needs. Currently, we provide Super Metro Fiber Optic Network, Internet Access, Leased Line/IP VPN, VSAT Links and Data Center. We understand that our internal resources are the valuable keys in providing higher value creation to customers. Bear this in mind, we have no hesitation to invest in qualified people and assets for the operations of our networks. During the last 3 years, we've been developing our backbone network aggressively and completed the construction of Submarine Fiber Optic Cables connecting Dumai - Batam - Singapore, backbone network in Java and Sumatera, and access in major cities in Indonesia. Our Dense Wave Division Multiplexing (DWDM) Technology is designed to accommodate at least 10 Gbit capacity (STM-64). Our services have been covering across domestic (Java, Sumatera, Batam, Bali, Kalimantan and Sulawesi) and international (Singapore and Hong Kong) areas. Our motto is simplicity and the ultimate goal is to give higher value to customers for the services we offer. We assure you doing business with us is so enjoyable and easy!